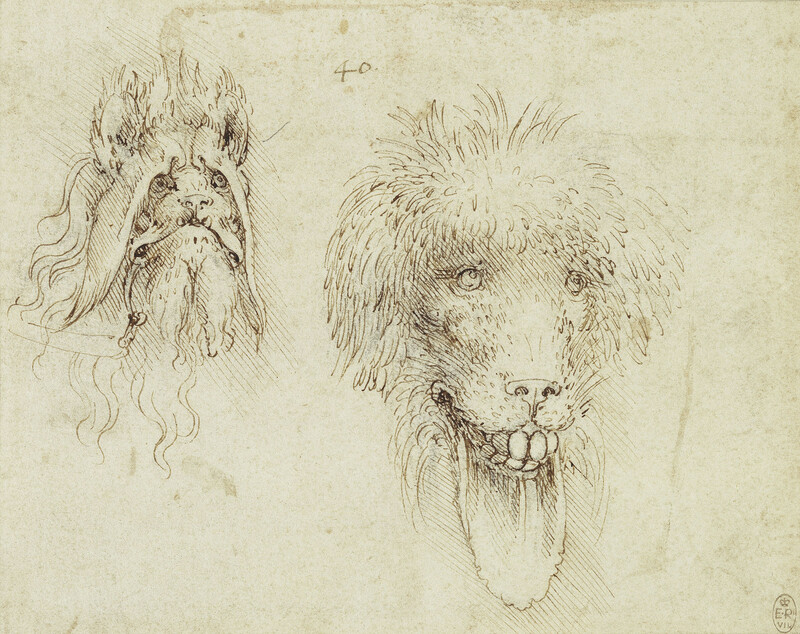 Two studies of the heads of grotesque animals; one with a long mane and drooping folds of skin; the other, on the right, is like an Afghan wolfhound but with big teeth and an under-lip hanging like a tongue. The head on the right is canine, a hound with the grotesquely hanging lower lip that was an accepted sign of inanity. The other head is less easy to characterise: it has a mouth like a pug dog, a lion's mane, ears like a shaggy bear, and strange wrinkled flaps from the brow hanging down the cheeks. The bit and bridle that emerge from its mouth suggest that it was an idea for a fantastic mask, to be worn by a costumed servant pulling a chariot or float in some procession.